Our kitchen overlooks the former mill leat and we get a lot of pleasure from watching the wildlife residents and visitors. Of these, the moorhens are by far the most industrious, raising two broods of young in a season. Their nest is formed from reeds they have cut and arranged in bowl-form concealed in the rushes or bankside vegetation. Moorhen eggs were always regarded as a delicacy. I remember as lads we used to tie a spoon to a stick and collect eggs, but always stopping in time to allow a clutch to be completed and incubated. Times have changed and it is illegal to take eggs now. The eggs hatch after about twenty days incubation, a duty shared between male and female, with a typical clutch of five to eight eggs. The chicks, like large bumble bees, are soon scuttling across the top of the water chasing insects and grow quite quickly though it takes seven weeks before they fledge and the process is repeated. Unusually the chicks of the first brood stay around to help in the arduous task of feeding family number two. The youngsters are grey brown and do not achieve the full adult colouring until the end of their first winter, at which stage their parents will drive them away to find a territory of their own. On one August afternoon many weeks ago we were watching the mother and three chicks feeding round the lily pads. The chicks were about three weeks old and perhaps the size of a blackbird. Suddenly there was a violent upheaval in the water and the chick next to the mother vanished. The mother was extremely distressed and looked in all directions for the ‘disappeared’ calling loudly. Peace returned and the water resumed its motionless mirror surface. 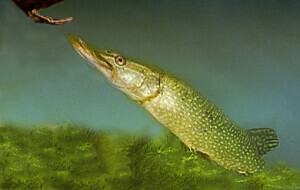 A pike had just secured its lunch. Whilst there is joy in watching the natural world, it does not come without suffering. Most moorhen broods will hatch around five chicks, and as they predate on insects to survive, they themselves are the objects of predation by crows, magpies, pike, otters, foxes and mink – and it is sad to see their number dwindle and it is rare if more than two are left at the end of the summer. Although I have never seen it, when threatened it is documented that a chick will climb on its mother’s back and she will fly away with it to safety.